Direct mail once ruled the roost, in the B2B space it was the quickest way to mass market to your customers and prospects and I remember just 10 years ago executing campaigns to thousands upon thousands potential customers, then sitting there waiting for the postman to deliver a sack full of responses or for the switchboard to go crazy. Sometimes it worked, sometimes it didn’t. Not having the ability to properly track what was going on with your campaign was always the thorn in the rose for marketing managers. How many actually got delivered? How many opened? How many read? How many acted upon? And what are the costs associated to not knowing. Then came email and e-marketing platforms. They literally revolutionised the way we ran campaigns. You could have an idea in the morning and by the afternoon have people placing orders. Not only that, you knew how many were delivered, opened, clicked and actioned upon. Instantly. It was however, a victim of its own success. Such was its power that everyone wanted a piece of the action. The pigeon hole at work was getting less mail and the email box was constantly ‘exceeding its limit’. Instead of getting excited about the look and feel of a well created HTML mailer, people started getting irritated by the sheer volume and in a lot of instances, poor targeting of the revolutionary form of comms. In my opinion, the pendulum is swinging back to direct mail and faster than ever before. It’s both unusual and very satisfying to get a really well designed, personalised, high quality piece of direct mail through the door. So much so that the last few pieces I have received have all had my undivided attention, whereas their e-mail brothers and sisters have made their way to my recycle bin without a second thought. The great thing about direct mail today, compared to direct mail 10 years ago are the tools we now have to support such campaigns. Before, it was a return address or a telephone number to reply, but now we can give the target market options. Call, post, tweet, e-mail, like, scan, become a fan and so on… What’s more, when high quality direct mail becomes part of an integrated communications strategy the chance of end user engagement multiplies. Evaluate what your audience actually receives from you today, then think about how you would feel on the receiving end. Wouldn’t it be nice to have something that looks and feels great through the post again? We still use direct mail as part of our overall marketing mix and find it effective when combined with other touches – email, social, sales. We no longer use a blanket approach – the more you send, the more responses you get – but rather use a more targeted and customized approach. There is a great synergy between direct mail and the web, especially when considering the impact on the environment. Instead of sending full brochures or packets, we now send summaries or teasers and drive to the web for full information. 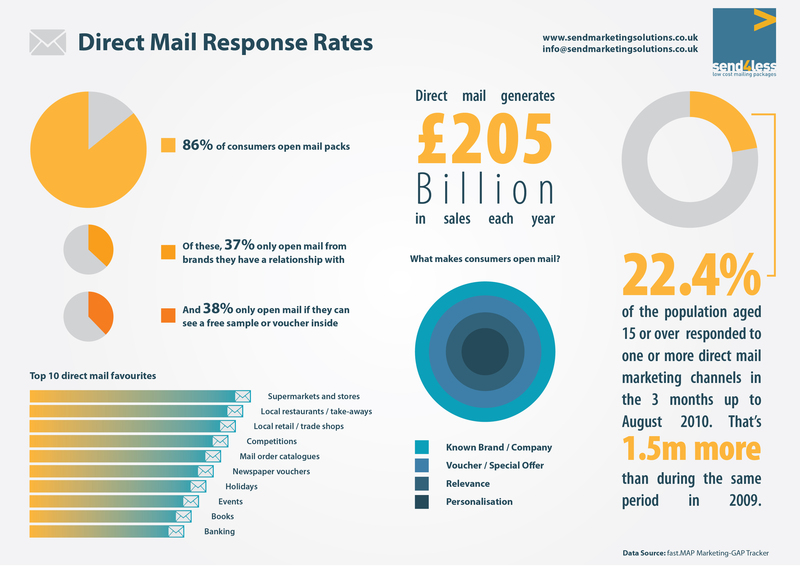 Direct mail still serves the purpose of getting a response, but we are able to reduce costs, improve relevance and timeliness of information, improve tracking and data mining and provide greater exposure for other products and services that may interest customers. I agree, direct mail has been through a transitional phase. Now there are such sophisticated ways to capture data, it is easy to see why the medium is making a come-back. Well said. I thoroughly agree but it can be hard moving clients from the mindset that email is simply direct mail without the price of a stamp! Email open rates are falling but the response rates we’re getting to even the simplest pieces of dm are on the increase again. Great news for our beleagured print industry. That’s welcome news, Gareth, thanks. I love DM and I certainly don’t think I could move away from it – not right now and not for the foreseeable future. The latest campaign that I have run with the rest of my team for The Grocer has had phenomenal success – much greater than standard DM and like Gareth suggests, this is because we made the end reader feel special. Our magazine is already well-known in the industry so we decided that those not already subscribed may want a free copy to look through. Instead of going with the usual sample copy and personalised letter, we skipped that and went directly to personalising the covers with a short message that was relevant to that particular segment of data. We also used PURLs so that the web pages the potential customer was to land on were also personalised. From there we followed up with matching personalised emails. Everything from the data to the messaging, the images to the channels is important in a campaign like this, but it would be nothing without the DM! I’d definitely recommend this approach as we’ve seen a lot of success from it! For “good direct mail”, let’s not forget a relevant offer and your targeting. You can do everything you mention above and if the piece isn’t targeting to the right audience with a relevant offer…it is just another high quality, pretty piece of mail. I like your article. I want to know more about the direct mail marketing. Interesting article Gareth, I am in the middle of putting a new campaign together which will have a very specific target audience, I may suggest that we change tactics and go for direct mail, rather than an e-shot? called Still not sure if e-shot is for you? why not contact us to discuss how you could try e-shot for free. customers as they click through the link.